Huda Beauty Lip Contour Matte Pencil in Trophy Wife and Liquid Matte Lipstick in Trophy Wife & Muse. The Huda Beauty Lip Contour Matte Pencil retails for $19US and $25CAN. This set I got for $30CAN contains to 2 half size Liquid Lipsticks and a full-size Lip Pencil. 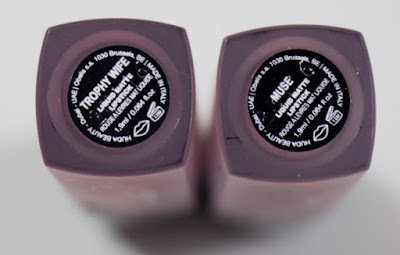 Lip Contour Matte Pencil in Trophy Wife and Liquid Matte Lipstick in Trophy Wife & Muse. 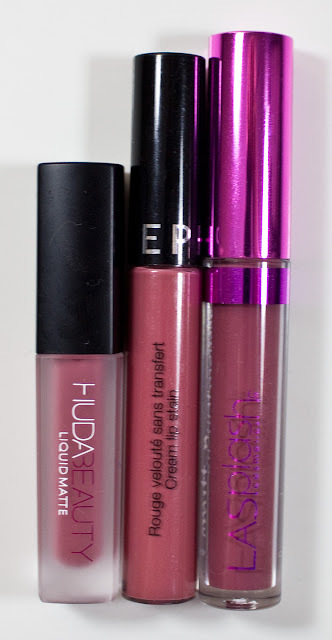 Huda Beauty Lip Contour Set Ingredients. Huda Beauty Lip Contour Matte Pencil in Trophy Wife. Huda Beauty Liquid Matte Lipstick in Trophy Wife & Muse. Huda Beauty Liquid Matte Lipstick in Muse & Trophy Wife. 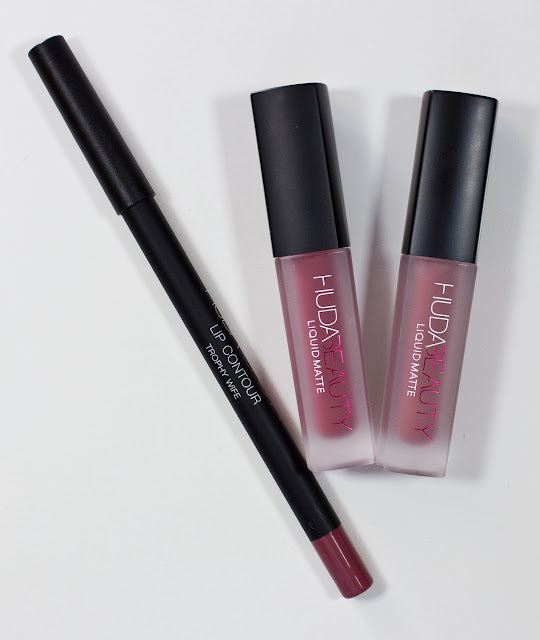 The Liquid Matte Lipstick formula is a matte finish with a very think consistency that could feather if you apply too much on the lips slightly instead of thinly. The formula takes a few minutes to dry and set with a very little tacky texture the fades after the first hour. The Lip Contour Matte Pencil was slightly semi-opaque while applying it but still give good coverage and smooth in application. It also feels incredibly thin on the lips as well. Trophy Wife is a subtle pink rose with a matte finish. Muse is a dusty rose with a matte finish. Trophy Wife pencil is slightly deeper and more vibrant than the Liquid Lipstick. Wear: For about 6-8 hours. This shade wore down with dignity, so I found no harsh fade edges. Packaging: Is a thick frosted tube with a standard doe foot applicator and black cap. The lips pencil is a composited wood/plastic pencil that needs to be sharpened. Daylight & Flash swatches: Huda Beauty Lip Contour Matte Pencil in Trophy WifeLiquid Matte Lipstick in Trophy Wife & Muse. Huda Beauty Liquid Matte Lipstick in Trophy Wife. Huda Beauty Liquid Matte Lipstick in Muse. Huda Beauty Liquid Matte Lipstick in Trophy Wife, Sephora Cream Lip Stains in 13, and LASplash Smitten LipTint Mousse Lovestruck (Lovegood). Daylight & Flash swatches: Huda Beauty Liquid Matte Lipstick in Trophy Wife, Sephora Cream Lip Stains in 13, and LASplash Smitten LipTint Mousse Lovestruck (Lovegood). Sephora Cream Lip Stains in 13 is lighter and less saturated than Huda Beauty Liquid Matte Lipstick in Trophy Wife. 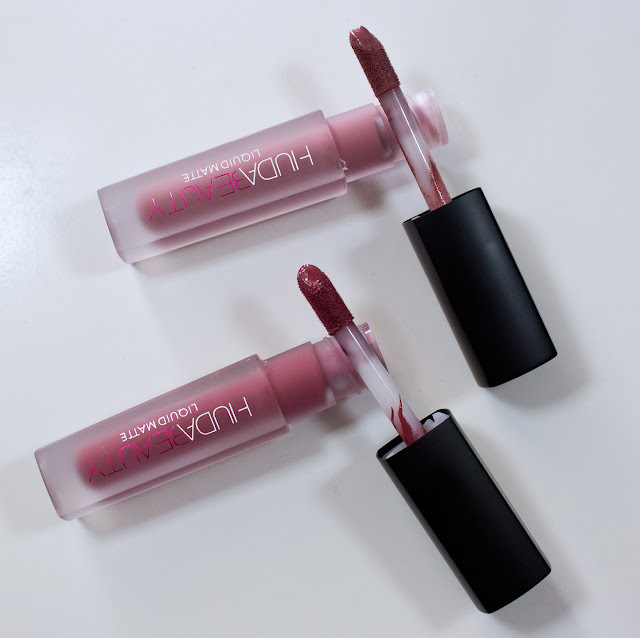 LASplash Smitten LipTint Mousse Lovestruck (Lovegood) is deeper than Huda Beauty Liquid Matte Lipstick in Trophy Wife. 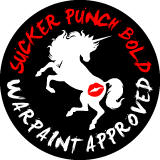 WARPAINT & Unicorns Makeup Favourites of 2016!